Millhouses Park on the Radio! John was on BBC Radio Sheffield on Wednesday 18th July on the Toby Foster Show. If you want to listen to the interview, why not go to http://www.bbc.co.uk/programmes/p00v2wt0 and play the programme. You’ll need to fast forward to time index 20 minutes to hear John. The programme will be available until 25th July for you to listen to. 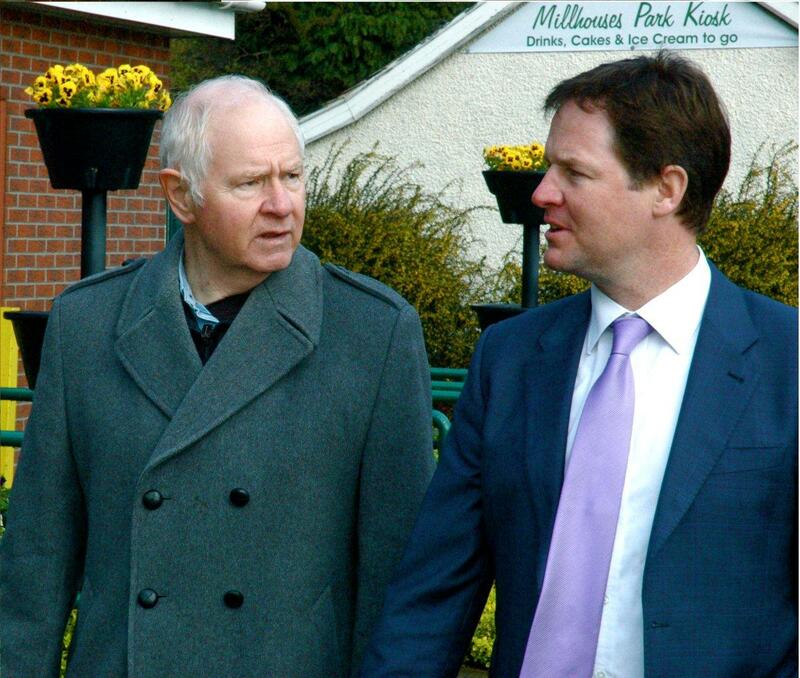 During a tour of the award winning Millhouses Park, Sheffield Hallam MP and Deputy Prime Minister Nick Clegg praised the local community for securing exceptional improvements to their park. Last Friday (April 13) Nick was taken on a tour of the Park’s outstanding facilities by John Brighton and Kate Stow of the ‘Friends of Millhouses Park’ Group. Over the years the Friend’s work has secured many new attractions, including an outdoor ‘splash’ water play area, a climbing wall, a zip wire, new Oak Avenue, Scooter Roadway, Fish Pass, Sensory Garden and an outdoor gym. Over a cup of tea in the Café, Nick spoke to local people from across the community, including the ‘Pudding Ladies’ who run the Café , the Bowling Club and others, to personally thank them. “Millhouses Park is a jewel in the crown of Sheffield’s green spaces. But what makes it even more impressive, is that the first class facilities are as a direct result of an outstanding community spirit. A great new video from the Environment Agency! Find out all about our amazing Fish Pass! Sheffield enhanced its reputation as the country’s greenest city as it scooped a record number of awards for its parks and green spaces. The city picked up four new Green Flag Awards this year at Charnock Recreation Ground, Manor Fields, Millhouses Park and Wyming Brook. Sheffield is now the leading authority in the Yorkshire and Humberside region with 22 Green Flag Awards – the national standard for quality parks and green spaces. Councillor Leigh Bramall, the Council’s Cabinet member for Environment and Transport said: “This is fantastic news for Sheffield. These four new national awards reinforce Sheffield’s position as one of the UK’s greenest cities. They follow on from the city’s 18 sites that have already received Green Flag status. “The awards also showcase the city’s huge variety of top quality green spaces ranging from stunning outer city sites – in this case Wyming Brook, our beautiful city parks – Millhouses and of course our urban spaces at the heart of communities – both Manor Fields and Charnock Recreation Ground.